Francis sits on a bench with an older man, lamenting how the spirits all around them have destroyed his life, and the life of the dazed woman meandering nearby, his fiancée Jane. He recounts the tale of how a Dr. Caligari came to his town to exhibit his premonitient sleepwalker Cesare at the town fair. Caligari claimed that Cesare has slept his entire life, only waking in a trance at Caligari’s command to answer questions from the audience. 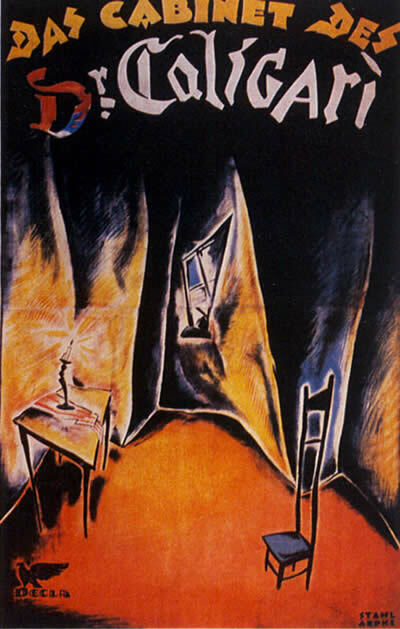 The clerk who authorized Caligari’s entry only reluctantly was found stabbed to death in bed the next morning, and when Francis’s friend Alan asked Cesare at the show “how long will I live?”, Cesare answered, “until dawn”. True enough, Alan was murdered in bed that night. Fueled by grief, Francis investigated the double murder, and was able to obtain permission from the police to pursue the lead of the somnambulist, hoping to prevent him from killing again. There was actually not as much cinematographic innovation as I expected. But I realized something about early silent cinema that I never did before. So many shots are vignetted or have other still photography tropes to them that it occurred to me that even in such a sophisticated narrative work as this, filmmakers were still thinking of cinematic film as photographs that move. Part of what gave me the impression that there was artistic camera work is actually the set design. The word that came to mind for me was surrealistic, but the term used academically for this film is Expressionism. The sets are heavily stylized stage pieces, creating a dangerous, jagged, off-kilter world. Even the caption cards are stylized in the same aesthetic. So this is another foreign-language film I hadn’t realized was foreign-language. I seem to recall seeing other foreign silent movies that had translated intertitles, but the version presented to me here had the original German cards with English subtitles. I wasn’t expecting that, but appreciated due to the stylization they had which may not have been faithfully replicated in a translation. It’s also a much more talky silent film than I expected. Some exposition-heavy scenes are straining at the technical limitation of having to stop the action to let the audience read what people are saying. For a psychological horror story, I didn’t feel any of the characters were all that deeply characterized. Caligari is an interesting mustache-twirler, but a mustache-twirler. Cesare is a haunted mannequin. Only thematic reasons necessitate that Francis narrate the story rather than an omnicient narrator. Since he gets murdered in the first or second act (of several delineated acts) Alan is probably not an active enough character to merit including in my summarized credits, but I’m impressed by the actor’s name “Hans Heinrich von Twardowski”. Perhaps the only silent film I know of that comes close to the strength of style and theme is Metropolis, which come to think of it, is also a German expressionist film, though I think the version I saw did have translated intertitles. Some more modern expressionism that comes to mind is Brazil, and The Hudsucker Proxy has to be in the neighborhood. The artistry that goes into such movies is to me an excellent case for relaxing our current preference for realism. After all, film is unreality only asking us to pretend it’s real. You beg the question, Can ANYTHING be faithfully replicated in a translation?